Hello friends! Ramadahan is nearly leaving us and Aidilfitri is just around the corner. How have you been doing this Ramadhan month? Do you eat a lot? Shop more? Hehe. I think my Ramadhan this year is pretty much simple and nice. Sometimes, my boyfriend would treat me for iftar at a fancy restaurant. But all the time, i would prefer to just eat simple dishes. Each year, I will spend more for this one special iftar at KLGCC. We are trying to make this iftar a yearly one, just because i really love eating there at KLGCC. 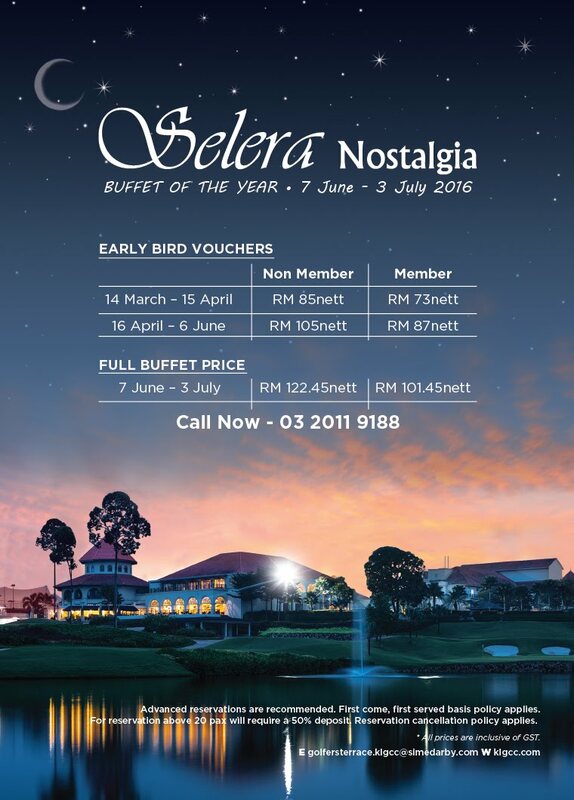 Well, not a golf club member as yet cause it damn expensive but i think i will be eating iftar there each year, insyaAllah. I don't really take the photo of the foods cause i did not take that much. I am only looking forward to eat their Dim Sum but i can only managed to find Yong Tau Foo instead. This year, they changed the Dim Sum's place so after eating the extra salty yong tau foo, i don't really feel like eating the dim sum. Boyfie likes their lidah bakar so much he took that one first and finished it off instantly. I don't really eat exotic foods (haha). This year, the food tasted a bit meh to me. I think, previous years has the best foods around and more variety compared to this year. This year, their top foods would be Apam Balik, Lidah Bakar. Others are just..normal. Maybe we took it quite early and we had the indoor aircond place to eat to the foods are getting colder towards break fast. The service are also quite slow this year. No one actually refilled our complimentary drink at all. BOTD : Althea Korea 1st Birthday Purchase! HAPPY 1st BIRTHDAY ALTHEA MALAYSIA! CANVA : Designs and more!